In the men’s 1500 freestyle it looked World Cup record holder Italian Gregorio Paltrinieri was on his way to another World Cup victory in the event, which would be his fourth this season; that is until the final 50 meters where it all changed. South African Myles Brown and Tunisian Ous Mellouli both missed their chance of dethrowning Paltrinieri in Dubai, they waited until the last minute in Doha, but both showed incredible speed in the last 50 meters leaving the Italian wondering what had just happened. Brown and Mellouli both out swam Paltrinieri by almost two seconds. Brown posted a 26.06, Mellouli a 26.19 while Paltrinieri recorded a 28.16. Brown took the event in a time of 14:36.19 followed by Mellouli who finished second in a time of 14:36.46 and Paltrinieri who touched in a time of 14:39.18. Hungarian Katinka Hosszu continued her incredible run at the World Cup collecting her first gold of the evening in the women’s 400 IM posting a time of 4:28.91. The race shaped up a lot like it did in Dubai with Miyu Otsuka of Japan challenging Hosszu for the first three hundred meters with Mireia Belmonte of Spain making her charge in the final 100 meters. Unlike Dubai Belmonte was not able to catch Otsuka who finished second in a time of 4:30.11. Belmonte finished third recording a time of 4:31.06. The top eight women at the halfway point finished in the same order by the end of the 100 meter distance. Ranomi Kromowidjojo of the Netherlands lead the way turning in a time of 25.42 just ahead of her fellow countrywoman Femke Heemskerk who turned in a time of 25.46. The Olympic champion out swam Heemskerk in the final 50 meters posting a time of 52.29. Heemskerk touched second in a time of 52.71. With the win Kromowidjojo swept the sprint freestyle events for the second World Cup stop in a row. Jeanette Ottesen Gray finished third in a time of 53.00. In Dubai Pawel Korzeniowski of Poland, Australian Robert Hurley and Myles Brown had an incredible showdown in the 200 freestyle and in Doha the race between the three was even more thrilling. Hurley lead for most of the race, but in the final 50 meters Korzeniowski employed the same strategy he did in Dubai, but with much more success. 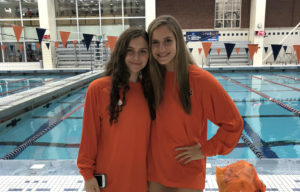 The Polish swimmer swam the final two laps in a time of 25.87 almost half a second faster than both Hurley and Brown, eventually winning the race in a photo finish, touching a time of 1:44.00. Hurley was able to just hold off Brown, finishing second by one one-hundredth of a second hitting the wall in a time of 1:44.10 followed by Brown who recorded a time of 1:44.11. The women’s 50 breaststroke saw another incredible race between two women who have become rivals over the last week. In Dubai Jamaican Alia Atkinson out swam Russian Yuliya Efimova in the 100 distance only to be bettered by the world champion in the 50. Yesterday in Doha Atkinson took the 100 event and today Efimova once again got the better of her in the 50, but not by much. Efimova won the event in a time of 29.22 followed by Atkinson who finished in a time of 29.25. Moniek Nijhuis of the Netherlands finished third in a time of 30.40. The men’s 100 breaststroke saw Russian Vlad Morozov and Australian Kenneth To battle in yet another event. Morozov took the event winning in a time of 57.53 followed by To who recorded a time of 58.05. Giacomo Perez Dortona of France finished third in a time of 59.03. In Dubai coming into the finish of the men’s 100 butterfly it looked like American Tom Shields was going to pull off the upset by out touching World Champion Chad le Clos of South Africa, but le Clos was able to hang on to win the event in a time of 49.14 beating Shields by two one-hundredths of a second. That story line changed today in Doha. Unlike in Dubai Shields never fell behind le Clos, leading the race at the halfway point turning in a time of 23.02. Shields maintained his lead over le Clos in the final 50 meters winning the event in a new American record of 48.80, breaking his own record of 49.01, which he set in Berlin. le Clos finished second in a time of 49.05 followed by Konrad Czerniak of Poland who posted a time of 50.33. After winning the 200 backstroke on the first day in Doha Ukrainian Daryna Zevina went into the 100 event looking for the same result. At the 50 meter mark Syaka Akase of Japan, who won the 100 backstroke in Dubai, led the way turning in a time of 27.76. Zevina came back in the second 50 meters eventually overtaking Askase, but she was not the only one showing tremendous second half speed. Who else but Katinka Hosszu, swimming her second event of the evening, gave Zevina a run for her money. Hosszu just missed making up the 41 one-hundredth of a second lead Zevina had over her at the 50 finishing one one-hundredth of a second behind the Ukrainian. Zevina won the event in a time of 57.48 followed by Hosszu who recorded a time of 57.49. Akase finished third in a time of 57.54. Frenchman Jeremy Stravius took the men’s 50 backstroke in a time of 22.99. Stravius not only posted a lifetime best, beating his previous best of 23.28, his time is also the fastest in the world this year. Robert Hurley picked up his second silver of the evening hitting the wall in a time of 23.08, just missing his own Australian record of 23.04. Florent Manaudou of France finished third in a time of 23.43. And make that two. Katinka Hosszu collected her second gold of the evening winning the women’s 200 butterfly in a time of 2:06.60. Sophie Allen of Great Britain and Miyu Otsuka of Japan had the fastest two last 50 meter splits of the race, which enabled them to take over the second and third place finishes in the event. Allen posted a lifetime best of 2:07.20 to place second followed by Otsuka who finished third in a time of 2:07.66. After being upset in the 100 butterfly earlier in the evening Chad le Clos made sure that he would be the one standing on the top spot on the podium after the 200 IM. le Clos went into the final 50 meters trailing Kenneth To, but out swam the Aussie by almost a second and a half in the freestyle eventually winning the event in a time of 1:53.32. To won his second silver medal of the evening recording a time of 1:54.36. Hungarian David Verraszto finished third in a time of 1:56.14. Melani Costa of Spain lead the way in the women’s 400 freestyle after the first 100 meters. Costa won the event for the third time in three World Cup stops posting a time of 3:59.88. Coralie Balmy of France finished second in a time of 4:01.66. Former world record holder Camille Muffat, who has been having a tough start to her fall events, finished third in a time of 4:03.28. For the second World Cup stop in a row Vlad Morozov swept the sprint freestyle events. Morozov took the 100 freestyle on the first day in Doha in convincing fashion where as the 50 was much, much closer. Morozov once again had the best start of the field, followed closely by South African Roland Schoeman, which was how the race continued with Morozov beating Schoeman by one one-hundredth of a second. Morozov won the event posting a time of 21.03 followed by Schoeman who finished second in a time of 21.04. 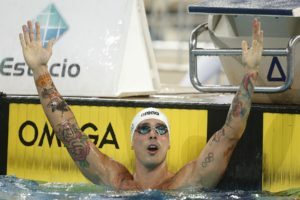 American Anthony Ervin finished third in a time of 21.23. At the last two World Cup stops in Moscow and Dubai even though Yulia Efimova has been in tough in the sprint breaststroke events, going head to head with either Alia Atkinson or Ruta Meilutyte she had owned the 200 meter distance, that changed tonight in Doha. Kanako Watanabe of Japan took control of the race at the halfway point and never relinquished the lead from then on. Watanabe won the event in a time of 2:18.90. Efimova finished second in a time of 2:19.48 followed by Watanabe’s Japanese teammate Miho Takahashi who posted a time of 2:19.96. After being upset in the 100 IM in Dubai by Alia Atkinson, Katinka Hosszu came back in Doha taking the event, her third gold of the evening, in a time of 58.43. Amit Ivry of Israel finished second recording a time of 58.66 followed by Theresa Michalak of Germany who posted a time of 59.49. In the final men’s event of the evening Radoslaw Kawecki won the 200 backstroke with ease posting a time of 1:48.93. Tom Shields, who finished second to Kawecki in the same event in Dubai, won his second medal of the evening, collecting the silver touching in a time of 1:51.64. Australian Ashley Delaney finished third in a time of 1:52.90. After winning the 50 butterfly at the World Championships in Barcelona the only woman who has been able to defeat Jeanette Ottesen Gray of Denmark is herself. Ottesen Gray won the event in Eindhoven, Dubai and tonight in Doha finishing in a time of 25.06. The only place the Dane did not finish in the top spot in the event was in Berlin where she was disqualified. Melanie Henique of France finished second in a time of 25.60 followed by Inge Dekker of the Netherlands who finished third touching in a time of 25.56. The French team made up of Florent Manaudou (21.22), Jeremy Stravius (20.87), Melanie Henique (24.61) and Anna Santamans (24.44) won the event in a time of 1:31.14, breaking the World Record of 1:32.52 set by the Japanese in Dubai. China finished second in a time of 1:32.74 followed by the Japanese who posted a time of 1:33.80. Katinka Hosszu wins her 57th world cup race in the 400 IM. 4.28 for her. Ranomi wins the 100 free in 52.29. Jeanette Ottesen Gray third in 53.00. OK time for Jeanette since she said she was very tired and made some technical mistakes but she’s happy with how her stroke changes are bedding in and will be faster in Herning. I am enjoying this contest between Efimova and Atkinson in the 50 breast, they are pushing each other to good times, unlike the 200 where Efimova has no opposition at all. I’m not sure but I believe that Alia Atkinson trains in Texas with Breeja Larson. She has much more success in short course than in long course so far. And Efimova is only 21! I thought she was older. I watch her for so long. Two years ago, she was training in Florida with a club team,and I know she was there leading into the Olympics. She swam collegiately at A&M, but I don’t she’s there anymore. I don’t think she is still at Texas AM. She graduated a couple years ago and she moved away sometime after that. She might be training in Florida somewhere? You’re right. Her club is the South Florida Aquatic Club.